Kiss me, I'm petroleum-free! Apply this naturally moisturizing honey lip butter to soothe dry chapped lips, or if you just want a healthy looking sheen. 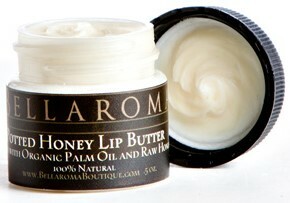 This lip conditioner is blended with organic palm oil, organic Brazilian honey and has a soft, creamy, buttery texture. It has naturally high levels of antioxidants--- rich in Vitamin E antioxidant complex (tocotrienols & tocopherols). You can apply with fingers tips or use a q-tip applicator. If you have excess balm on your finger, apply on cuticles! This formula also makes a great cuticle salve. 100% natural. Buttery moisture for your lips....pucker up! ALSO TRY OUR: "Honey Eucalyptus Lip Butter"!